Squirmy 8 month old + Scissors = Me afraid of cutting off an ear. Will's hair was starting to reach that point where it was technically not in his eyes if we swept it to the side and the curls over his ears were curling back on themselves so I finally resolved that it was time for a haircut. 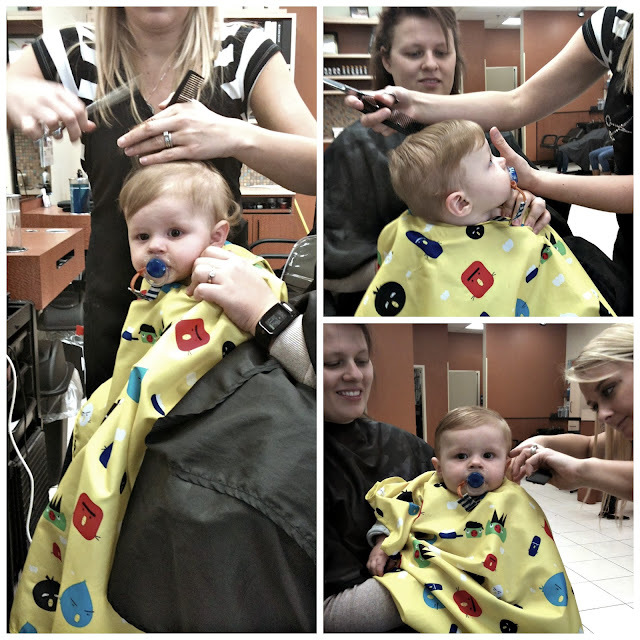 I had a hard time with this since I really didn't think Will's first haircut would come before his 1st birthday. The other thing was that while I cut Nate's hair, I didn't want to cut Will's hair (see above) so we we needed to find a place that would cut an eight month old's hair. After getting some recommendations from friends, we headed over to the Hair Cuttery near us a couple of weeks ago. They were so great and so was Will. He sat on my lap the whole time (didn't cry once) and I was so impressed by the stylist's skills at cutting quickly and accurately in the few seconds of stillness. Will didn't squirm too much but he still wanted to look around so he definitely wasn't still the whole time. After about 15 min Will had a cleaned up haircut (which I think makes him look so old), a certificate and a few locks of hair as a keepsake. I'm so glad we decided to go the salon route... it was stress-free and worth every penny (and his ears are still intact).